Q. What is maca, and is it a healthy food I should include in my diet? A. Maca (Lepidium meyenii) is an Andean root vegetable in the cruciferous family, most commonly consumed today in powder form. It’s believed to enhance sexual function, fertility, and drive. In another era, Inca warriors ate maca before battle to increase energy and stamina. Also called “Peruvian ginseng” because of similar claims related to vigor and libido (not botanical similarities), maca is a supplement typically added to smoothies. As with many supplements, it may be too soon to say how pronounced the benefits of maca really are. We do know that maca, which has no known side effects, is a source of calcium and other minerals, like iron and copper. Put the preventive and health-giving powers of good food in your hands. 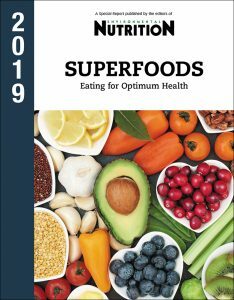 Get your copy of Superfoods. Q. What are the health implications of “ultra-processed” foods? A. There is increasing concern by health experts that the easy availability of highly processed foods is contributing to the ever-increasing rates of obesity seen around the world. As a result, three types of food processing have been defined by researchers. Type 1 foods are unprocessed, for example, an orange in its natural state. Type 2 foods are type 1 foods whose nutritional properties have been reduced because of processing, such as bread or canned vegetables, as well as ingredients like fats, oils, sugars, flours, and starches. Type 3 foods are “ultra-processed” foods made by combining types 1 and 2; examples include fast foods (think cheeseburger, fries, and orange soda.) Often, types 2 and 3 foods lack nutritional value. Many experts believe the greater the consumption of types 2 and 3 foods, the greater the risk for obesity and chronic diseases. Type 3 (ultra-processed) foods are usually more palatable because of added ingredients, like sugar, fat, and salt. Diets made up of types 1 and 2 foods are far superior nutritionally to diets made up of types 2 and 3. Tags blood pressure, calcium, depression, diastolic blood pressure, diet, fertility, food, ginseng, health, healthy food, highly processed foods, increase energy, iron, maca, nutrition, nutritional value, obesity, postmenopausal, postmenopausal women, processed foods, side effects, sugar, supplement, supplements, symptoms of depression, testosterone, ultra processed foods, vegetables.